First of all I have to say I knew I'd love Bilbao--or Bilbo as the city is known in Basque. I don't know why I knew this--but I did. Like millions of other people, I first heard of the city when the Guggenheim museum landed like a wavy UFO on the bank of the river Ibaizabal or Nervion, depending on who you talk to. I saw pictures in travel magazines and dreamed of visiting one day--but of course not actually to breach the doors of the Guggenheim. I hate museums, as you will know if you've been following my blog for any length of time at all. Within about an hour of being in a museum, I start getting what I will coin here as "museum legs," a muscular condition characterized by the need to run laps around artwork when one is categorically prohibited from doing so. The proper behavior in a museum is to walk excruciatingly slowly, to nod knowingly at works of art which are heavy on concept and light on whatever separates one completely black canvas from another. I don't know. The Guggenheim in Bilbao will always be more loved for its shell than for the art it contains. 1. 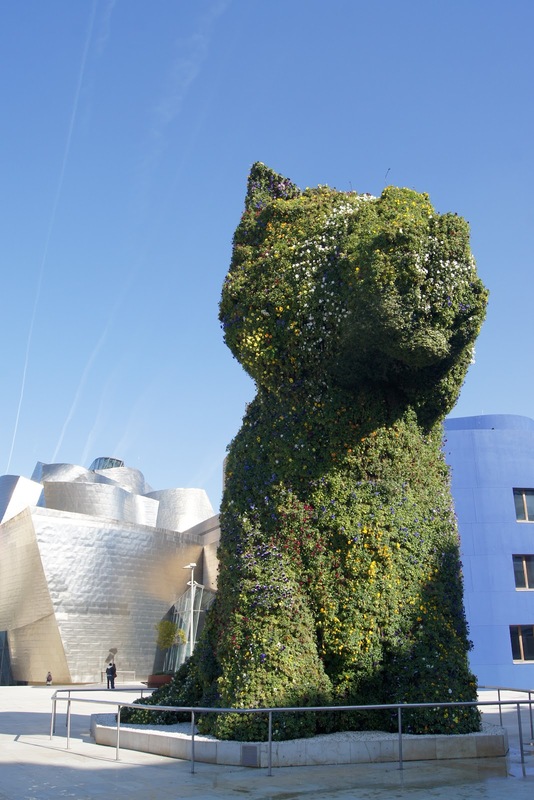 The above notwithstanding, The Guggenheim and its Flower Dog are certainly the first reason to love Bilbao. If I was paying attention to my audio guide, there are only 133 works of art on display in The Guggenheim right now, and I think I nodded knowingly at all of them. I could have trotted around them if I'd needed to. There`s so much space in The Guggenheim. 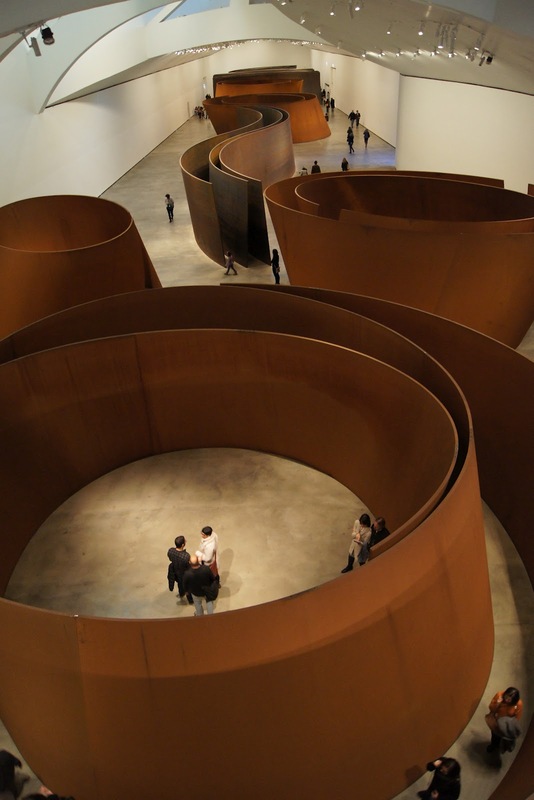 I even walked--quickly--through Richard Serra's enormous steel swirls and thought about my existence in space and steel--that is, until my museum legs made me run out and order a glass of Rioja at the museum restaurant. 2. Pintxo Bars. These are like Tapas Bars where you can graze typical Basque pintxos--which I'm told is Spanish for skewers although very few of the pintxos are actually on skewers--and drink wine at wonderfully reasonable prices. A small glass of Rioja is usually less than 2 euros. 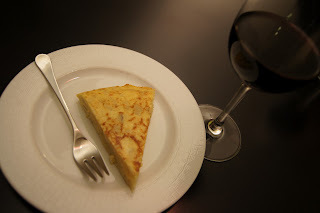 For readers concerned about eating gluten-free, you can eat the tortilla, a potato and egg pie filled with ham, cheese, mushrooms, or lots of other ingredients (pictured below). 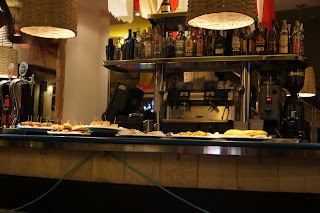 We spent a few hours at the Pintxo bar Santa Maria because it was just down the street from our hotel in the casco viejo--drinking one small glass of Rioja after the other. 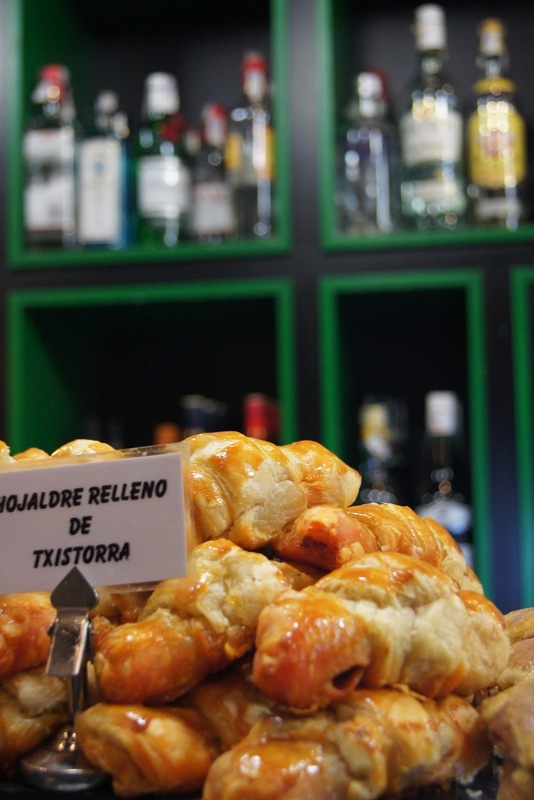 Have a look at this GREAT POST by Lauren Aloise on the pintxos of Bilbao. 3. Everything's cheaper in Bilbao! I hadn't planned to go shopping for clothes, but the prices were just too good to pass up. I'm surprised my carry-on bag was big enough for everything I bought. Our three-star hotel in the old city was only 60 euros a night. 4. I don't have children, but if I had a few I'd dress them up like pirates, cowboys and Smurfs and take them to Bilbao for Carnival. Saturday night was mild and dry: a perfect evening for the traditional Carnival processions through the city and especially the old town (casco viejo). I was expecting a parade, but what we witnessed were hundreds of families--from toddlers to great grandpas--each group dressed in matching costumes (troupes of spacemen, witches, bumble bees, etc.). 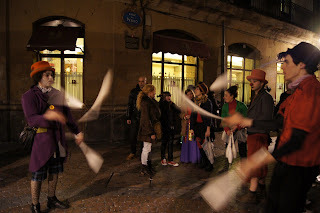 There were also groups of friends dressed alike and processions with large carts playing loud music. 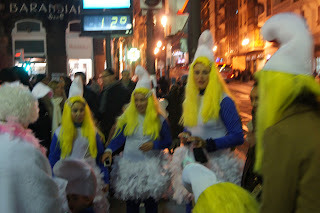 Carnival in Bilbao is a lively, fun and relatively safe place. 5. And Bilbao is a friendly place. 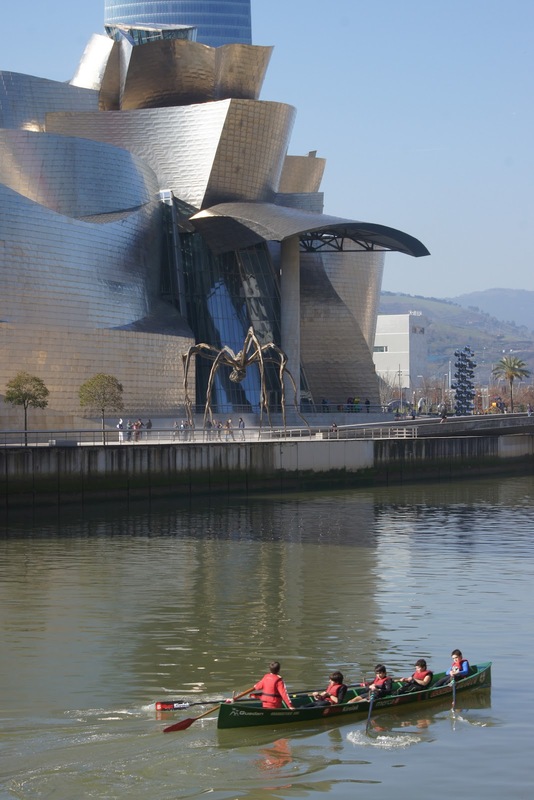 One advantage of a city's relative inexperience with tourism--compared to, say, Venice's two-hundred-year-old love/hate relationship with tourists--is that Bilbao still seems truly grateful for guests. Not once was I treated rudely. Not once did a waiter sneer at my attempts to speak Spanish and say gruffly "I speak English. What do want?" as a server did in Paris last summer (I told her I wanted a different server). The big tourist cities of Europe are over you quite frankly, Mr. Tourist. They don't think they need you. London, Paris, Rome, Florence and Venice will always have visitors no matter how incredibly awful they treat you, the humble-sweet-wonderful tourist who's spent a lot of money to be there. May Bilbao never become so jaded. I HEART Bilbao/Bilbo.Have you been to Bilbao? What were your impressions? A Year Ago on I Must Be Off!